It looks like all the tech giants are bringing something new for its users during their respective 10th anniversary celebrations. Apple launched iPhone X and now Amazon is out with a new Kindle named Oasis. 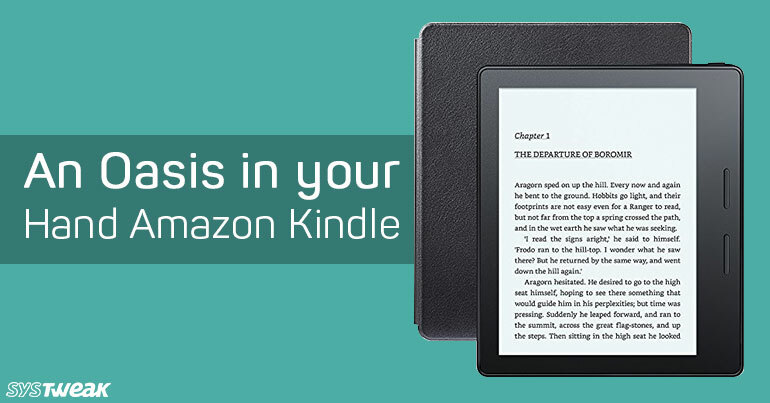 It is the most expensive, innovative and waterproof Kindle reader allowing user to enjoy reading while sitting by the pool on a boat or places where you won’t take your paper books as they may get wet. It is the best book reader I have used so far it has all the features that I always wanted in a reader. But as we know no technology is flawless so here we have listed the pro and cons of the new Kindle reader. Looks like the new 2017 Kindle Oasis has heard me. It has 2 physical buttons at the center to turn pages, one feature I was waiting eagerly for. These buttons are customizable you can set direction as per your writing hand making it easy to move while reading. The display is excellent with great clarity and proper lighting. Not only this it has font controller to help resize the font. The gray aluminum body looks awesome in hands, making it easy to handle the device and the touchscreen display with 12 LEDs, adaptive light sensor making it an ultimate device. This is quite an improvement all making it better than 2012 Kindle Paperwhite. On one end, it has a MicroUSB port for charging and on the other there is a power button with a thickness of 3.4mm. On the other side, there is batter with a thickness of 8.3 mm. Making it thick from one end. If you are looking for a stand go with Kindle Oasis leather standing cover. It magnetically attaches the device, can be folded back behind the reader and even provides screen protection to it. The cover is available in different colors like saddle tan, midnight, and merlot. Alternatively, you can also try using Water-Safe Fabric Standing Cover it has the similar design and looks amazing. It is available in charcoal, indigo, and sandstone. It looks like 2017 Kindle Oasis will bring many new functions and software updates, as the display auto-rotates when you change the direction of physical buttons. Also, you can customize viewing, reading, listening and display size from standard to large from the settings option. Large size increases the font size making it easy for older people to read books. Apart from these common settings there are many other options like refreshing the page, changing language, parental controls, Bluetooth headphone connections and WiFi connections, night mode. Also Read: 5 Hidden Amazon Echo Features You Probably Didn’t Know About! But there is one thing that I did not like is there is not option to enable a 24-hour clock. You can find buttons for home, back, quick settings, Goodreads, Store, search, and menu at the top of the navigation bar. To enable disable airplane mode, Bluetooth and to sync the content, you can use quick settings. Also, the backlight controller can be accessed from quick settings. To open navigation bar while reading tap at the top of screen, it will open a bar below that allows you to Go To, X-Ray, font size and type selector button, share, and bookmark. Also, you can share your book status to Goodreads, Facebook, and Twitter. The X-Ray feature is helpful it helps to know more about the people in history and vocabulary. You can see information about the page you are on and the pages left to read at the bottom of the screen. A tap on the page flip buttons shows two thumbnail options to sieve through the book. To highlight a word, add notes and to share it tap and hold the word to see all the options. As the 3.5 mm jack is missing it support listening to Audible books via a Bluetooth headset, looks like Amazon followed Apple. Also Read: Welcome to Amazon Go: The Future of Shopping! There are 2 variants of the device available the 8GB WiFi is or $249.99 and the other with 32GB is for $30. However, if you are looking for cellular connectivity model it will cost $50. To get rid of the offers from the lock screen you need to pay extra $20. The new 2017 Kindle Oasis is amazing it has all the features that were missed in older versions. It makes reading more easy and enjoyable you won’t feel like skipping a single book when you have this reader in your hand. Also, the audio added to it makes it even more worthy when not in a mode to read just enjoy listening to the audible books. The new Kindle Oasis may not be a pocketable device, but it is easy to carry in your hand. It makes you look smarter with Kindle in your hand, you can use it anytime anywhere. An amazing device which lets you read without any constraints.